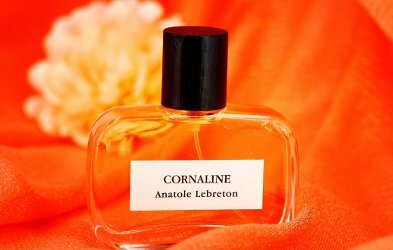 French niche line Anatole Lebreton has launched Cornaline, a new fragrance named for the stone carnelian. The notes include bergamot, carrot, geranium, peach, hyacinth, orris, ylang ylang, belle de jour, benzoin, musk and vanilla. Anatole Lebreton Cornaline is available in 50 ml Eau de Parfum, €95. I am excited to try this! Incarnata is the only one of the line I have tried, but I really liked it. I had to look up what kind of ingredient belle de jour might be and it looks to be morning glory. That’s the flower for my birth month and I would love to know what it smells like. Although with the carnelian inspiration and notes, I’m expecting something carrot-y. Some sort of morning glory, or some flower related to morning glory…not clear if the French use the term the same way the English do. Oh, and good luck, hope you’ll get to try it! While this fruit and flower combination would usually make me look further, I’m interested in this one. Those Anatole Lebreton fragrances I know are not for the faint of heart, so I’m curious what they made with this unobtrusive list of notes. I’ve enjoyed (at least) all the LeBreton fragrances so far. I have a FB of Incarnata, am considering the same with two others, and my Grimoire sample has gotten a surprising number of positive comments from men and women, even though it doesn’t appeal to me directly. He has a terrific nose.